Small and compact e²TANGO-50 may be used as an stand-alone device in indoor and outdoor switchgears, container stations and wiring compartments. The device may also be used to provide complementary protection functionality to PLC controllers in small MV switchgears (such as modular switchgears, compact distribution blocks). The device may be used in harsh atmospheric conditions.e²TANGO-50 may interoperate with PLCs using MODBUS protocol or operate as a stand-alone device - short-circuit is indicated via relay contact. Fault indication has to be reset manually using a button. Viewing measured values, event history and confirming events (confirm operation status) is possible using communication links. e²TANGO-50 devices have 4 settings banks and a recorder which logs 32 events. The device has a real-time clock. 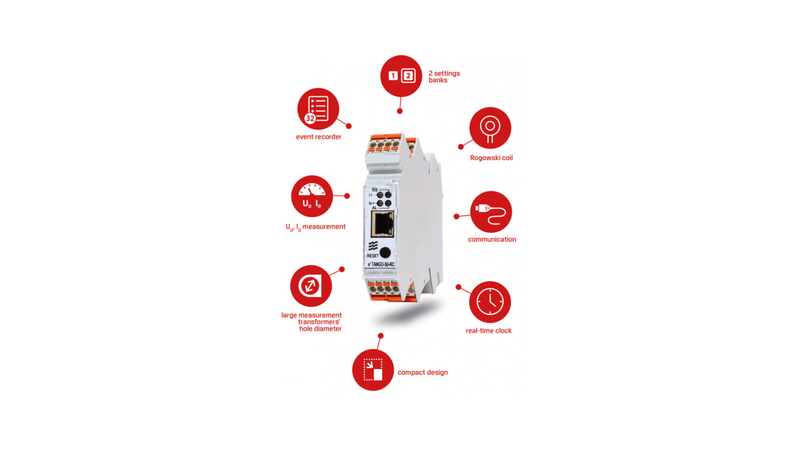 Communication with the device is possible using Ethernet or 2-wire RS485. Phase current may be measured using Rogowski coils (e²TANGO-50 RC) with 1mV/A sensitivity, alternatively phase current may be measured using current transformers (e²TANGO-50 CT). Depending on version the I0 current may be measured or calculated. The device may be adapted for operation with a totalizer calculating U0 voltage based on phase voltages. It is also possible to measure U1, U2, U3 phase voltages using voltage transformers with a standard input voltage of 2/ V 3 or 3.25/ V 3 (e²TANGO-50 RCU).